Stamping and Scrapbooking - two of my addictions! Oh, how good it is to have time to play with my stamp sets! I love having them but it really is a waste of money if they just sit on the shelf - even if they do look pretty. Last night I had a night to myself so I played with one of the new Christmas sets in the Spring 09 Mini Catalogue - Season's Surfin'. I just had to buy this set - I love the images - they are perfect for watercolouring. 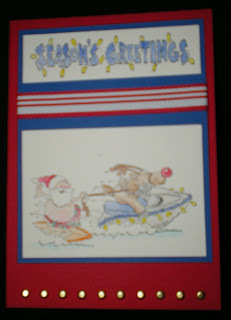 The first card is very non-traditional Christmas colours - Real Red and Brilliant Blue. I didn't set out to use these colours, they just came out of my watercolouring. I stamped the image on watercolour paper using Black Staz-On ink. I coloured the images using an Aquapainter and Watercolour Wonder crayons. The line of gold brads along the bottom was inspired by the yellow Christmas lights around the jet-ski. This palm tree Christmas tree is just so cute! I coloured it very simply with Gorgeous Green leaves and Close to Cocoa trunk (Aquapainter and Watercolour Wonder crayons as above). I decided this one should be more traditional colours so the base is Gorgeous Green and the images are mounted on Real Red. I just had to put the greeting on an angle - it didn't look right straight! I hope that this inspires you to get a start on your Christmas cards too. It is never too early, you know. PS Sorry about the fuzzy photos - I couldn't get them any clearer than this. This one was requested by one of attendees. She wanted to learn how to fold the Origami Shirt. This is a great male card - whether for a birthday as I have made it or for Father's Day. I took the colour scheme from the DSP (Washington pack) - Bashful Blue, So Saffron and Pumpkin Pie - but I substituted Riding Hood Red for Real Red as I love using the In Colours. This one uses the Sense of Time stamp set from our Spring Mini Catalogue. I love this set as it really works well for male cards (do you see a theme developing here?). 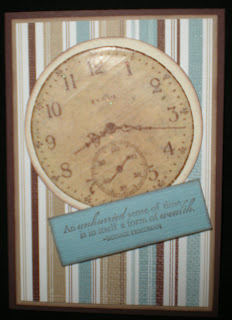 We used the Cracked Glass technique on the clock face to give it a fabulous aged look. Again, the colours came from the DSP (Parisian Breeze Specialty) - Chocolate Chip, Baja Breeze and Kraft. We stamped the clock face on Confetti Cream to accentuate the aged look and I aged it further by sponging Chocolate Chip ink over the Cracked Glass face. 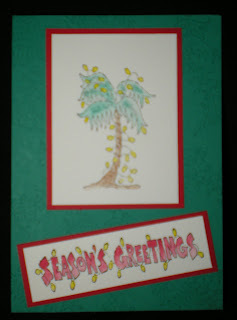 Our bonus card got us started on making Christmas Cards. It is a tri-fold card with a difference. You can get the instructions here. 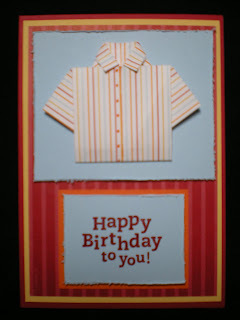 I just love making these cards - they are so much easier than they look. I have kept this one simple using just 2 colours - Riding Hood Red for the card base and the same DSP paired with Kiwi Kiss for the tree image (which is embossed in gold). I have the cardstock cut for a few more of these all ready to go so I think that is what I'll do tomorrow night (I was going to do it tonight but Blogger has been very slow to load my photos). I have been frantically busy at work - bringing work home most nights and sometimes over the weekend too - for the last month but I haven't been totally neglecting my stamping. I ran a workshop a couple of weeks ago and, at the host's request, we played with the Shaving Cream technique. This technique is a lot of fun and produces a great result but it is quite messy so be prepared for some clean up if you try it. Below are the 2 cards we made. These cards use the background created with the Shaving Cream technique (ink colours Baja Breeze and Pacific Point) and the stamp set - Unchartered Territory. As Father's Day in Australia is this coming Sunday I challenged myself to use the Shaving Cream technique on cards for men. The top card adds texture to the edges of the Pacific Point mats using the distressing tool from the SU Cutter Kit. I used Paper Piecing for the lighthouse and cliff on the second card. I was really pleased with these two cards and so were the ladies at the workshop. This card used a technique I had wanted to use for a while - bleaching. The Hippo was black embossed on Kiwi Kiss cardstock and then bleached was applied using a paintbrush. I was thrilled with the effect - the Kiwi Kiss turned to So Saffron. 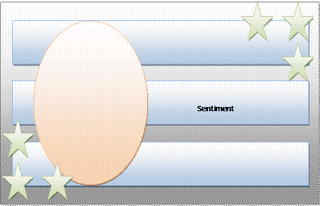 The "balloon" has Dazzlin' Diamonds over the Pumpkin Pie heart for some bling. On this scrapbook page I managed to use all three of our theme items (DSP, Ribbon and a Punch (Crop-a-dile). The base is Certainly Celery textured cardstock (I love the textured cardstock). 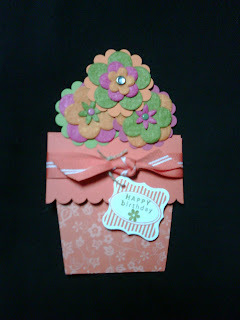 I used the Big Bold Birthday set to create the cupcake, using the Stamp-a-ma-jigto make sure everything was correctly aligned. The Crop-a-dile was used to emboss the dots down the right-hand side. I have been wanting to make one of these Coaster boxes ever since I saw one on the blog of one of my SBS sisters, Karen Rogers. I sourced the coasters through Karen (thanks so much) and used a tutorial from SCS for the instructions. The stamp set is A Rose is A Rose, a 2-step set which I adore. The DSP comes from the Bella Rose pack (another favourite). For the projects that Natasha contributed go to her blog Natasha's Creations. I have been playing with the new sets from the Australia/NZ Spring Mini Catalogue so I'll have some more creations to show you soon. I am having so much fun now I am stamping again! I decided to play along with Janet's Corrosive Challenge this week. It was an inspiration challenge. This is the inspiration picture. I just love the colours in the clothes and hair of these dolls. However, I was having trouble with a layout so I decided to use Janet's Corrosive Challenge 21 which was a sketch challenge. This got my mojo going again! And here is the result. 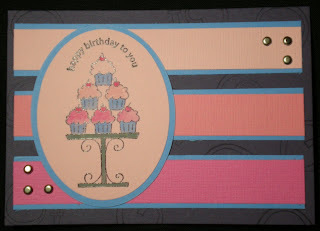 The colours are Elegant Eggplant for the base card, Ballet Blue, Pixie Pink, Regal Rose and Pretty in Pink. The image and sentiment are from Crazy for Cupcakes. I really love this card! I hope Janet doesn't mind that I moved the sentiment. Stay tuned for more creations from a Stamp Camp I helped with in July. Yes, I am still alive! No, I didn't catch the swine flu, although we did have 7 days in home quarantine after our return from the USA. Life has been very hectic since my return, hence I haven't posted until now. In fact, I haven't done much stamping until now. I have a friend who is having twins in a month or so and I managed to sit down and make her a set of birth announcements last week. However, the batteries in my camera died and I didn't have a spare set so no photo! I did sit down after dinner tonight and make my own version of the Flower Pot Card that was published in the SCS Weekly Inkling newsletter this week. I'm really happy with it. The "pot" is Tangerine Tango. The insert is Whisper White on Tangerine Tango. The "flowers" are made using a scallop circle punch with Flower Fusion felt flowers adhered on the top and attached with brads. It really is quite a simple card. This one is on it's way to my sister as a very belated birthday card. 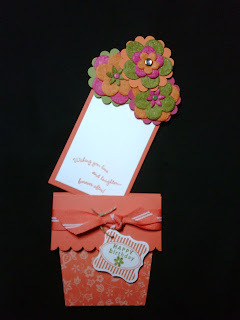 I used Curvy Verses for the sentiment inside and Cute & Curly for the tag. Please accept my apologies for not posting during April (I can't believe it has been a whole month). I have been very busy with work and getting ready for our US holdiay - which begins tonight! I will definitely be off-line for the next 3 weeks but pleased check back at the end of the month when I return - hopefully full of energy and suffering withdrawals after 3 weeks without stamping! I am a Stampin' Up demonstrator in Australia. I use this blog to share my stamping creations with any and all who visit. I hope that you are inspired by what you see here. If you would like more information about the Stampin' Up products, a copy of the Australia-New Zealand catalogue or are considering joining the Stampin' Up family, please contact me at willbooks@ispx.com.au. I would love to help you with all your stamping, cardmaking and scrapbooking requirements. My goal is to lose 30 kgs by 31st December 2009.